I was recently very ill with an extremely nasty bout of salmonella poisoning. This landed me in the hospital for three days, and when I’m sick and relatively helpless, I turn to comfort reading. I rarely have the time to re-read these days — it seems that there are so many new books begging for my attention that I seldom get back around to the ones I’ve loved for years. But in times of illness, back I go to old favorites. 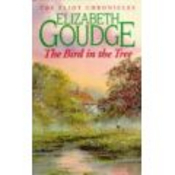 And there are few books that bring me more pleasure and comfort than Elizabeth Goudge’s trilogy of novels about the Eliot family: The Bird in the Tree, Pilgrim’s Inn, and The Heart of the Family. The Bird in the Tree, published in 1940, introduces the Eliot clan. Lucilla Eliot, the grandmother of the family, has created a home at Damerosehay, on the Hampshire coast, that is truly home for all the Eliots, no matter how far they wander or what problems they may have. She holds the strings of the family in her hands, and she is the bright center for all of them, including the grandchildren Ben, Tommy, and Caroline who are staying with her. But when her best-beloved grandchild, David, comes home to Damerosehay to visit her, she understands that all is not well with him. He explains, painfully, knowing how much it will hurt Lucilla but needing to tell her the truth, that he has fallen in love with Nadine Eliot, his uncle George’s wife and the children’s mother. Their love is beautiful and all-consuming: they plan to marry once Nadine has divorced George, despite the shattering blow this will deal to the family, to the stable home Lucilla has built, and to the children. Lucilla hears David out. Quietly, she asks two things: that Nadine and David not make their decision public for two weeks, and that they spend those two weeks together with her at Damerosehay. She will talk to them once, but only once, about the step they propose to take. The couple can only agree, knowing that their love can withstand anything. During those two weeks, however, the history of the house of Damerosehay — always owned by people of extraordinary selflessness and fidelity — and Lucilla’s own history begin to affect David and Nadine. The unutterable beauty of the setting puts their striving minds and bodies at peace, and they begin to think of Nadine’s children, of George, and of the way it is sometimes possible to build something beautiful from the outside in. In the end, it is not only Lucilla who wrestles for dominion over their actions, but the entire history of Damerosehay. Pilgrim’s Inn (also published under the title The Herb of Grace, in 1948) finds the Eliot family five years farther on. Nadine has remarried George and had two more children, but she is not content: there is a part of her that is always reserved for David, the great love of her life. David himself had a bad war and a nervous breakdown after it, and although he hates himself for always taking from the people he loves and never giving, he can’t stop himself. And he, too, still loves Nadine, though his self-discipline is better than hers and he tries hard to stay away. Into this brittle and broken situation come two immense forces: Sally Adair, the daughter of a famous painter, who is as innocent and whole and transparent as anyone can well be, and is clearly made to be David’s wife; and a marvellous old pilgrim’s inn on the river, which welcomes Nadine and George and the children with open arms and shows them that goodwill and generosity can triumph if we are willing to exercise the necessary discipline. Rue — the herb of grace — is an astringent herb, the grace of single-mindedness, and it is this grace that Nadine and David need: the willingness to let go their dual allegiance so that they can give themselves wholly to the families and lovers who need them. The Heart of the Family, published in 1953, moves the Eliot family farther forward in time. David and Sally are married, with two children, and living at Damerosehay (Lucilla has moved to nearby Lavender Cottage.) David, a famous actor, has brought a stranger into the family circle: Sebastian, nominally his secretary, but actually a man wracked with physical and spiritual pain and close to death. Neither David nor Sebastian seem to understand the bonds that link them — Sebastian dislikes David intensely, and David believes he’s worthy of the dislike — but they do seem to be bound together until they work out their emotional ties. This book is more difficult and less active than the previous two. There are a good many set pieces, where characters move slowly into place in order to have long philosophical or metaphysical conversations. Two of the main characters (Lucilla and Sebastian) are very close to death, and are pondering this transition; several others (Ben, David, and Sally) are undergoing major life changes and upheavals in the way they understand the world. Still others (the small children) have only recently arrived in the world, and have insights to offer on that account. This book has to do with war, and the despair of war, and the legacy war leaves to our children, not only in the world, but in their very bodies and souls. It’s painful to read in places. Still, Elizabeth Goudge infuses all of her work with the deeply-held belief that pain, rightly offered, can be prayer; that good will always triumph when the chaff is cleared away. She never denies the reality of suffering. Instead, she shows the purpose of it. These three novels are some of my favorites. They are absolutely wonderful — heartwarming in the very best way possible, the way that affirms life and love. I’ve read them over and over again, for their beauty, their tenderness, their humor, for the strength and compassion that flows through them, and perhaps most of all for their portrayal of goodness. It can be difficult to give a portrait of a really good person without becoming sentimental and oversimplifying matters. Goudge does this brilliantly. In this review, I haven’t even mentioned my favorite character in the books, Hilary, a priest, one of Lucilla’s children. In him, I recognize real, solid, tested goodness. It’s not an easy task for a novelist. I recommend these novels very highly, and I hope you will all fall in love with Elizabeth Goudge. I am so sorry to hear that you have been so unwell – hope you are better now? I recently read Elizabeth Goudge’s The Little White Horse which I loved. This trilogy sounds absolutely like the reading material I am looking for at the moment – I need some comfort reading. Thanks for the great review. I loved The Little White Horse, too! I think she writes equally well for children and adults, which is rare. And for me, she does some of the best comfort reading on earth. I’m sure you’ll love these. PS in fact, it is my Birthday soon so these are going straight onto the list! I’m sorry you’ve been poorly – hope you’re feeling better now, or that you’ll start feeling better soon. Bloomsbury Bell waxes lyrical about Elizabeth Goudge and these sound wonderful…if only I were allowed to buy them! I’m going to add these to my increasingly long birthday books list! Wonderful review, and I’m glad you’re better. Salmonella is not pleasant. I’m sure you’d enjoy these. Good for you for sticking to your resolution, but if you absolutely cannot resist, these would be good used-book choices! And thanks for the well-wishes on my health. Great review. Just finished rereading The Bird in the Tree (also taken up because I was sick) and I completely agree that Goudge’s books deserve reading over and over again. So happy to find others love these as much as I do! Not proud of myself about this, but I lifted my copy from my local library 33 years ago. I have read all three books at least 25 times, and is my absolute favorite comfort book. I have read many of her books and contacted Hodder/Stoughton 20 odd years ago…she had passed away by then unfortunately, and I was deprived of telling her how much her books about the Eliots meant to me, and how much I wanted to read just one more about them. My all time favorite fictional family. I swear I am going to go to England some day and find that corner of heaven for myself to see…. I just found this entry. How funny, my local library burned down about thirty years ago (Perth, Ontario) and when they rebuilt and asked people to bring their books back, I brought everything I had – except The Eliots of Damerosehay! It was just not possible….. I saw online the area that I believe must have been the inspiration for this trilogy. Oh how I want to check it out with my own eyes. Buckler’s Hard looks just like the Hard described in Pilgrimi’s Inn. And the ruins of an Abbey are nearby. Look up Beaulieu. Anyone up for a Goudge Tour? I visited Buckler’s Hard and Beaulieu as a child and when I read the description of the area around Damerosehay year’s later just knew that’s where it was set. Now the memories are mixed up with the stories. Jenny, if you loved the Eliot story, you might try another trilogy…I’ve read this one as well at least 20 times and I love it almost as much as The Eliots of Damerosehay. It’s by Edith Pargeter, and the books are: The Heaven Tree, the Green Branch, and The Scarlett Seed. Amazing writing, beautiful characters, a great story. I hope you don’t find yourself in a hospital bed again, but if you do I highly recommend this trilogy!!! I have read and re-read Herb of Grace.It is a wonderful book and when ever I need rest and spiritual retreat I go to Damrosehay and Herb of Grace through this book and always emerge refreshed. My three books have been read so many times they have disintegrated. WHY have they not been re-issued.. every ‘Goudge Fan’ yell loudly at any publisher sensible enough to bring them out again!!! And the Edith Pargeter trilogy are also fabulous.. but heartbreaking. Thank you for listing the three titles in order. My mum was a huge Goudge fan and told me that The Herb of Grace was one of her favourite books growing up, but since she died I haven’t been able to bear to read it. Now I think I’m ready but I’d like to read the books in order and couldn’t find the titles listed anywhere online. Thanks! I’ll stop back when I’ve read them and take note of the suggestions above. I hope you’re still enjoying good health. Hi, Beryl — I’m so glad you stopped by. I adore Goudge’s books, and like you I think she is such a comfort in difficult times. I have read the Damerosehay trilogy many, many times, and I just finished reading Green Dolphin Country. I have some of her other works left to read, and I know I will find new and wonderful things to discover. What a beautifully written review! Try ABE online second hand books or Book depository. I bought Pilgrims Inn ( Herb of Grace) for $16 free post from UK. The problem with finding used copies of Elizabeth Goudge books is that those of us who revere this wonderful writer do not get rid of her books. We might lend them — with a wary eye and only to our closest friends — but we never, ever let them go. Thus their scarcity in used book shops (not to mention the growing scarcity of used books shops!). To all who are looking for the books – I found them free online, and spent several hours correcting them (they were PDF and I transformed them to doc, which meant some editing). I don’t know whether this is legal – can anybody help me about this? If it is, I’ll be glad to share with anybody who wants them. is where I found them. I’m so happy to have found kindred spirits. My favourite Elizabeth Goudge book of all time is “Henrietta’s House” And “The Dean’s Watch” is a close second. But they are all loved, and I’ve assiduously collected from charity shops and second hand book shops many of her wonderfully uplifting books for years now, and still have my original copy of “The Little White Horse”. She can always bring me out of darkness and back into the life of light. I’ve always pronounced Damerosehay as it reads, we each have it in our minds as a beautiful deep word meaning comfort and honour. I often recommend Goudge to friends who are ill — somehow she’s healing to mind and body, I think. Very comforting, as you say, but not in a drippy kind of way. I’m so glad you found your way here! I also read these books when I was young and I had the books in paperback. Unfortunately, my eyes got so that I couldn’t read the print in the paperbacks so I reluctantly donated them to Goodwill so someone else could enjoy them. However, I recently found that they were released in the Kindle format on Amazon. I immediately purchased all 3 and I started re-reading them. I’ve always remembered these books especially Bird in the Tree and I’m looking forward to getting reacquainted with the Eliots. I, too, love Elizabeth Goudge. I’ve just started a re-read of all I own, beginning with The Scent of Water, which may be my favorite of all. But the Eliot series is wonderful, especially Pilgrim’s Inn. I’ve wondered for years about the pronunciation of Damerosehay, but if nobody else knows either, I guess I won’t worry about it. I do wonder mightily about the real settings, though. Surely there are places in Hampshire that resemble the fictional villages. Can anyone help? I hope everyone checks back here occasionally. Please go to ABE Books which is www abebooks com (with periods inserted of course). All of Goudge’s books are there, many at low prices beginning at a dollar. Standard shipping is usually $3.99 so combined you can very easily get a book for less than ten dollars. Amazon also is a clearing house for used books. I think ABE is usually less. Some books are part of the Prime membership program and shipping is free. Also, I have read that the English and American versions have some differences. To put it baldly, it seems American editors dumbed down the language a bit as well as switching out phrases and colloclee65quialisms they believed would put readers off. I have just discovered this site whilst searching for a copy of the Elliot’s Trilogy, all 3 stories in one book. I don’t know why really, as I have them all individually. I just want to put in a word for Towers in the Mist, one of my most favourite books. I bought a second hand copy when at college in Oxford and have read it many times, it paints a wonderful picture of Oxford in times long past and means a lot to me. I have just taken it from the bookcase to read again, then I will start on the Elliot Chronicles. She is a wonderful writer and her books always make me feel better. How lovely to hear that someone else loves these books as much as me. I also reread them in times of need and love the way the reader feels so drawn into the family. I actually miss them when I finish reading and feel a bit lost for a while. What quality of writing can do that. Wonderful.